On 21st October 2014, GE announced the launch of Predictivity™, the company’s portfolio of Industrial Internet solutions to help customers across major industries in the Asia Pacific region reach new levels of productivity. Leveraging big data from intelligent machines and predictive analytics, Predictivity™ will help leading industry players particularly in the oil and gas sector, meet the region’s growing energy needs, while managing operational and capital efficiency. As a showcase of the company’s continued commitment to the region, GE Oil & Gas’ monitoring and diagnostics facility, the iCenter, was also officiated at an event co-organized with the Malaysian Investment Development Authority (MIDA). The launch ceremony in KL Sentral was officiated by Senator Dato’ Sri Idris Jala, Minister in the Prime Minister’s Office, CEO of PEMANDU; and graced by Jeffrey R. Immelt, Chairman and CEO of GE; and Datuk Phang Ah Tong, Deputy CEO of MIDA. Also at the event were Stu Dean, CEO of GE ASEAN; Visal Leng, General Manager, AsiaPac, GE Oil & Gas; as well as Ambassador Joseph Y. Yun, U.S. Ambassador to Malaysia. From left to right: Visal Leng, General Manager, AsiaPac, GE Oil & Gas; Stu Dean, CEO of GE ASEAN; Datuk Phang Ah Tong, Deputy CEO of Malaysian Investment Development Authority (MIDA); Dato’ Sri Idris Jala, Minister in the Prime Minister’s Department & CEO of PEMANDU; Ambassador Joseph Y. Yun, U.S. Ambassador to Malaysia; Jeffrey R. Immelt, Chairman & CEO of GE; Suhaimi Yassin, Senior GM, Project Procurement Management Department, PETRONAS; and Mohd Pahmi Mokhtar, Country Lead, GE Oil and Gas. GE is on track to deliver more than US$1B in incremental revenue this year from 40 Industrial Internet offerings, with US$1.3B in orders, helping customers throughout the world improve asset performance management and business operations. In addition, Predix, GE’s software platform that powers the Industrial Internet, will be made available to any company in 2015, allowing them to create and deploy their own customized industry apps at speed and scale to better manage the performance of their assets. GE Predictivity™ represents the overarching portfolio of GE’s Industrial Internet solutions and is powered by the Predix™ software platform, which was created to handle the highly complex scale, volume, velocity, security and regulations associated with industrial data. The potential for improved asset performance management is particularly great for GE’s customers in the oil and gas sector where production costs continue to escalate and safety, productivity and efficiency is critical to remain competitive and positioned for growth. 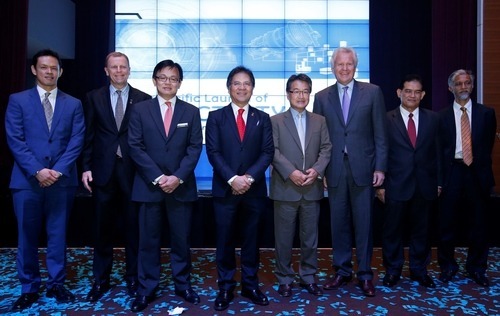 From left to right: Senator Dato’ Sri Idris Jala, Jeffrey R. Immelt, Stu Dean, Ambassador Joseph Y. Yun. Bottom: GE Oil & Gas staff. GE Oil & Gas’ Monitoring & Diagnostics technology is deployed on over 800 gas turbines and compressors in 27 countries, from LNG, through to Offshore and pipeline applications. Diagnostic Engineers in GE’s iCenters can call upon more than 11 million hours of machine data, from countries around the globe, gathered from intelligent sensors and allied with the power of big data and analytics to provide customers with recommendations to ensure that their equipment is performing at the best of its capabilities, and avoid unplanned issues. The iCenter in KL is fully integrated with the centers in Florence, Italy and Houston, Texas to guarantee direct access to discipline experts during critical events. The iCenter’s operations are managed by local engineers in line with GE’s commitment to supporting the growth of Malaysian talent.